Found paper, ball point pen, acrylic, screen print and spray paint on cradled birch panel. Coated in archival matte varnish. Finished in satin gel medium. 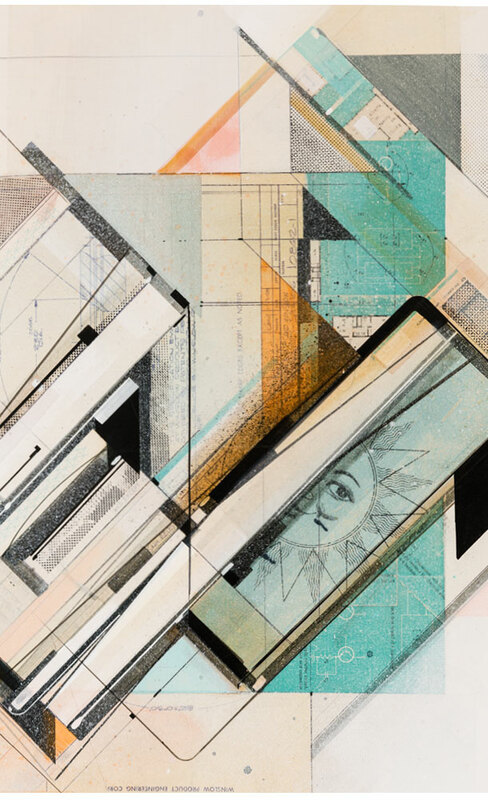 Tinney Contemporary is pleased to present a two-part exhibition curated by the founders of the Nashville Walls Project, Tova Lobatz and Brian Greif. Brick to Canvas - A Survey of International Street Art is a multidimensional look into the world of contemporary street art, urban contemporary or new contemporary. All the artists represented have extensive experience painting murals and have been exhibiting in galleries and museums around the world. 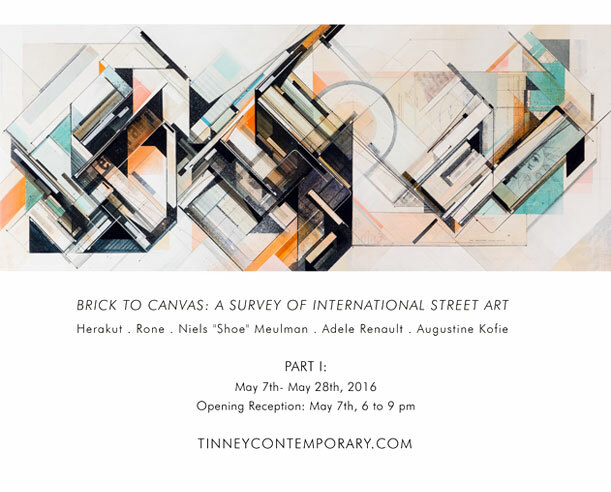 Brick to Canvas - A Survey of International Street Art is on view until July 25th, 2016 at Tinney Contemporary and is free and open to the public. Part I: May 7th - May 28th: Nashville Walls Project Exhibition: In conjunction with the “Nashville Walls Project” inaugural mural project in Nashville, Tinney will show works by international street artists - Herakut - Germany, Rone - Australia, Niels “Shoe” Meulman - Amsterdam, Adele Renault - Amsterdam, Augustine Kofie- United States, and Dal East- South Africa. Inside the gallery Herakut will be producing an experiential installation along with hanging 2D works. Herakut, Rone, Meulman and Renault will be in Nashville to paint public murals and will be present for the opening reception. In addition, Tinney will also be exhibiting Banky’s “Haight Street Rat”. The 7-foot tall beret wearing Rat is one of Banky’s most famous street paintings. The public will be able to see the Rat for free during the course of the exhibit. The Nashville Walls Project aims to bring internationally known street artists to Nashville. The founders, Brian Greif and Tova Lobatz, are art advisers and curators who met in San Francisco. Greif, based in Nashville, has spent a majority of his career in media, produced a number of movies (including “Saving Banksy”, a documentary about the infamous piece that will be hanging in Tinney Contemporary in May), and has been involved in the arts for decades. Lobatz, based in San Francisco, was the director of the leading urban contemporary gallery in the United States. She has founded her own public arts organization in San Francisco, and continues to advise private collections, corporations and curates independently.